Conductors and lines can be identified without an assistant (second person). 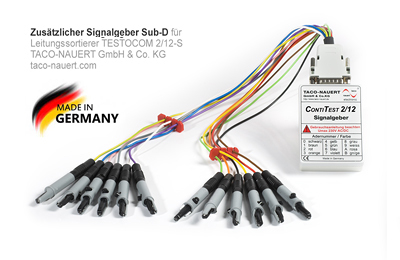 Up to 160 individual conductors can be clearly differentiated, by cascading multiple transmitters. Each transmitter designates up to 12 conductors, with the corresponding numbers. No battery required in the transmitter, only a 9-V battery in the display unit. Short circuits, line breaks, crossed lines, ground faults, conductor and transmitter number, external voltage and low battery are displayed. Termination of the test is indicated acoustically (continuity testing up to 5kΩ). Display und transmitter are able to withstand external voltages up to 250 V AC/DC. 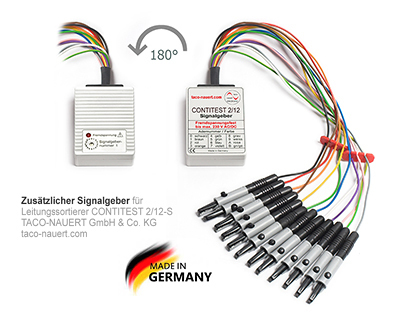 The CONTITEST 2/12 display can show the conductor numbering arrangement of the transmitter and the number of the corresponding transmitter. For this, the unit has two test lines which are connected with one or more transmitters via the line to be sorted. The transmitter number can then be mapped to the respective conductor. Depending on the application, the connection errors listed above can be displayed. 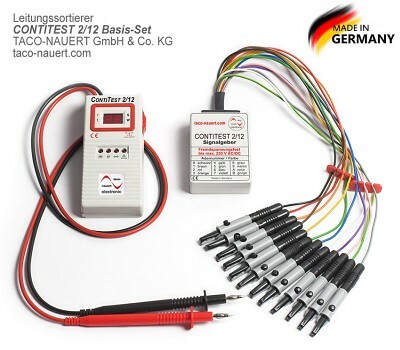 Delivery of basic set: display including a 9-V battery, with a pair of high-quality test leads, transmitter (encoding no. : 1) with 12 well-assorted alligator clips and instruction manual. Additional transmitter with 16 general-purpose codes. With 4-mm banana plug and fully insulated alligator clips. Additional transmitter as above, but with 15-pole sub-D connector, for customized applications.